“On Saturday April 13th, Union County Career Readiness department hosted the spring robotics competition for over 60 middle and high school teams. Students spent the last year building and redesigning their VEX robots to get ready for the competition. Ms. DePietro's Advanced Drama class has been working on a Defined Stem activty to help focus their advertising campaign for the upcoming production of "Mulan Jr.". Mrs. Kerr’s and Mrs. Emrich’s students were thrilled to learn from Amy Hanna, a volunteer with Refugee Support Services. Refugee Support Services is a non-profit organization that provides various resources for refugees who have been resettled in the Charlotte area. Operation Gratitude is one California woman’s solution to saying “thanks” to our many service men and women. Many US troops are deployed each year, spending time away from their family and friends to serve and protect us. Operation Gratitude collects donations and thank you letters from citizens around the country in order to make care packages for our troops. Parkwood Middle school is fighting cancer! 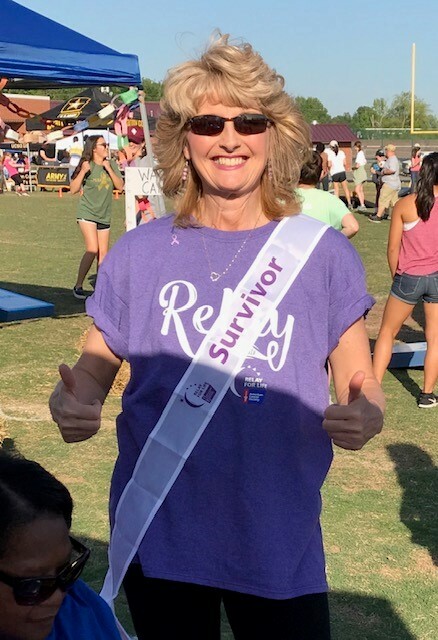 Relay for life is in full swing here at Parkwood. We will have different activities throughout the year to raise money for the American Cancer Society. Mrs. Kerr’s 6th Grade Language Arts classes participated in a “Genre Book Tasting”! These students got the chance to try out different genres from historical fiction to fantasy before their first trip to the media center. Every year for the past six years, Parkwood Middle School has competed in the National Science League competition. This year nearly forty different teams took to the challenge of preparing for and taking the “7th - 9th Grade General Science Exam”. These teams include schools from across the country, including states like New York, California, Texas, Michigan and Ohio. Topics from this test include physics, earth science, chemistry and biology. For the second time in as many years, Parkwood Middle School has finished in 1st place in the country! This past weekend Parkwood Middle and High Schools combined their talents to present "The Wizard of Oz" to the community. Crowds packed the theatre for all three performances and were taken on a journey over the rainbow. Parents and Community guests were amazed by the synergy and soft skills displayed by the 41 students who participated in the 1st Annual Mobile Application Competition at Parkwood Middle School. Parkwood Middle School’s Science OIympiad team came away with top honors at their regional tournament on March 17th. The team arrived with high expectations after finishing first in last year’s tournament. In addition to an overall first place finish in this year’s tournament, the Parkwood Bears took home the spirit award and Coach Jordan Marmara was named regional Coach of the Year. 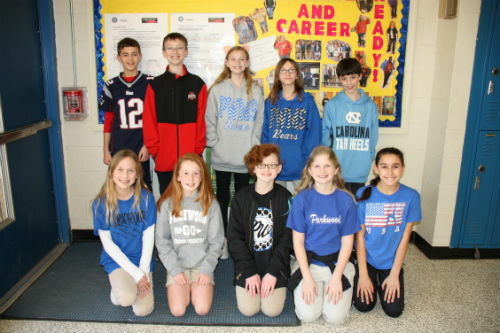 ollege acceptance letters are steadily rolling in for this year’s crop of high school seniors, and Parkwood Middle School is doing its part to prepare their students for those next steps. Based on a district-wide mandate from Union County Public Schools this year, all 6th – 12th graders are required to partake in a week-long college and career readiness initiative. 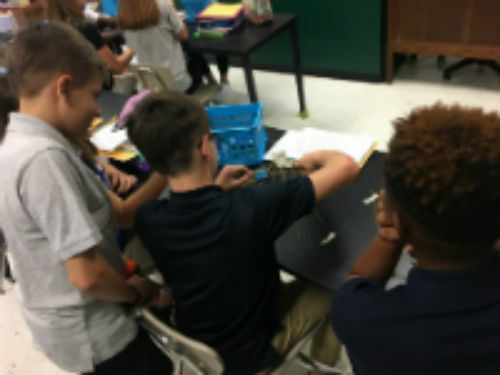 It’s up to each individual school as to how they implement that initiative, but Parkwood Middle certainly rose to the task! Massachusetts Institute of Technology (MIT) students Amber VanHemel and Lisa Tang recently traveled to Union County, where they spent a week talking to hundreds of UCPS middle school girls about the various career opportunities in STEM-related fields. Every year on March 2nd people from all walks of life: teachers, students, actors, athletes, and politicians come together to celebrate one thing we can all agree is essential to student learning: reading. PWMS Theatre once again wowed audience with their fall production. This year it was “Once On This Island”, the Haitian story of a young orphan who follows her heart and unites two sides of a divided island. In addition to raising awareness for the arts, this year’s production brought attention to the struggles of Haiti, and one dollar from each ticket sold was donated to “Hearts With Haiti”. This school year, several classes at Parkwood Middle and High schools are piloting MAD-learn, a web-based curriculum program that teaches mobile app development. The program allows students to learn and execute the fundamentals of mobile apps, including ideation, planning, design, creation, development, marketing, launch and maintenance. 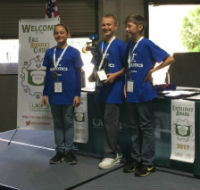 Parkwood Middle School Robotics Club competed in the 3rd Annual Robotics Classic at South Piedmont Community College on Saturday, November 18th, 2017. Several teams represented PWMS Robotics Club in the competition with Team Overdrive taking home the bronze for 3rd place overall in the Middle School Division. 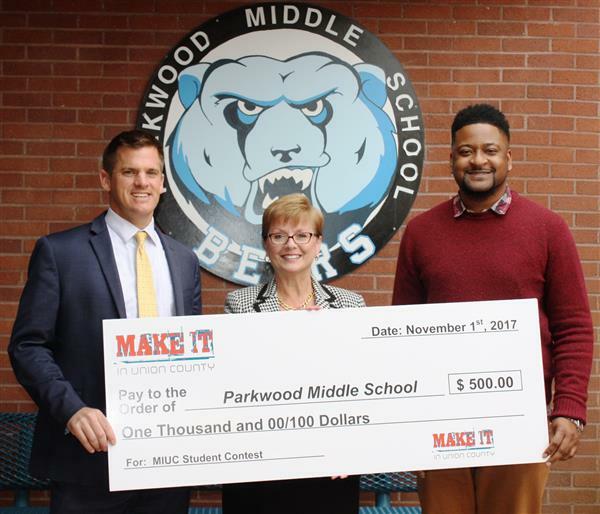 Parkwood Middle School wins $1500 dollars for Best Middle School in Division I for Make It in Union County. Mrs. Rossano's young historians and have explored and defined what life was like in Ancient Mesopotamia. There are many ways to define a civilization, but most scholars agree that when a society begins to form cities, it becomes a civilization. Not Guilty! Mr. Sanger Rainsford was found not guilty for the murders of Ivan and of General Zaroff. Shiptrap Island, South Caribbean Mr. Sanger Rainsford, a prominent big game hunter and author of several books on hunting, was recently acquitted of the murders of General Zaroff, formerly of the Czar’s army, and his manservant, Ivan. Mrs. Elizabeth Allen was the presiding judge. 6th grade students in Ms. Rothrock’s Exploring Technology class complete three different engineering challenges. Innovation, teamwork, and creativity; three qualities that are important for all our students to have. 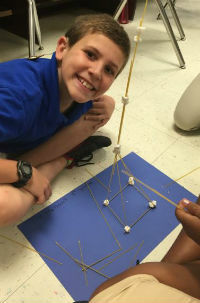 In 8th grade science classes this week these were put to the test as students worked together to construct the tallest tower among their classmates. On August 28th the halls of Parkwood Middle School were once again filled with the sounds of slamming lockers, sneakered feet, and laughing children. In classrooms and hallways, students reunited with friends, sharing their memories from summer. Teacher shared their expectations and hopes for the year with their usual enthusiasm, encouraging their students to set their sights on their goals from day one. Music is in the air this spring at Parkwood, with concerts being held by the many performance ensembles at our school. Audiences enjoyed a pleasing combination of classic and contemporary pieces performed by the PWMS Band and Chorus. 7th graders at Parkwood Middle had the opportunity to listen to four veterans share their war experiences and learned how to fold an American Flag. James Crump (WWII), Frank Cranford (Vietnam), and Bill Lane (Vietnam) came from the Indian Trail VFW to talk to the students about what they encountered during war. Recently, Ms. Townsend’s Spanish I students visited the Mint Museum Randolph in Charlotte, NC to observe several exhibits related to the ancient Americans. There are more than forty of the major societies from ancient Mesoamerica (Mexico, Guatemala, Belize, Honduras, and El Salvador), Central America (Nicaragua, Costa Rica, and Panama), and Andean South America (Colombia, Ecuador, Peru, Bolivia, and Chile). 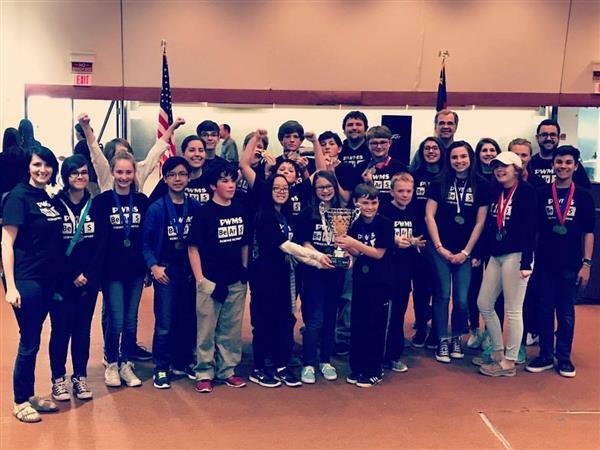 Parkwood Middle School’s Science Olympiad team continued to define excellence this past weekend by taking home the 1st place trophy at their regional science olympiad competition. 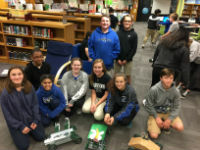 While only having one prior year of experience in this tournament, Parkwood’s best and brightest took to the books, sharpened their pencils, and began building and studying their way to the top on March 25th. On March 8th the PWMS Band, under the .direction of Mr. Jon Sale, participated in the annual MPA competition at Wingate University. After much hard work and effort, the band earned a superior rating - the highest any band can achieve. Parkwood Middle School Battle of the Books (BOB) team took home the championship at the annual UCPS competition. The team, consisting of 6th, 7th, and 8th graders, will now go on to compete in the regional competition in a few weeks. Discover China Day gave our 7th grade and 8th grade Chinese class students a great opportunity to explore to Chinese culture. This was the first year to offer this event without support of the Confucius Institute. The four presenters were from the local Charlotte community. Students watched the video for the brief introduction of Taiji and followed by the explanation how it benefits your health. Do you Know the History of Union County and How It Originated? The residents of Union County have become more true to the blend of why “UNION” was chosen as the name for our Magnificent county. The High Building of PWMS was recently treated to an incredible bulletin board display. In collaboration with sixth grade social studies, Ms. Howie's art classes studied aspects of Chinese art and culture. 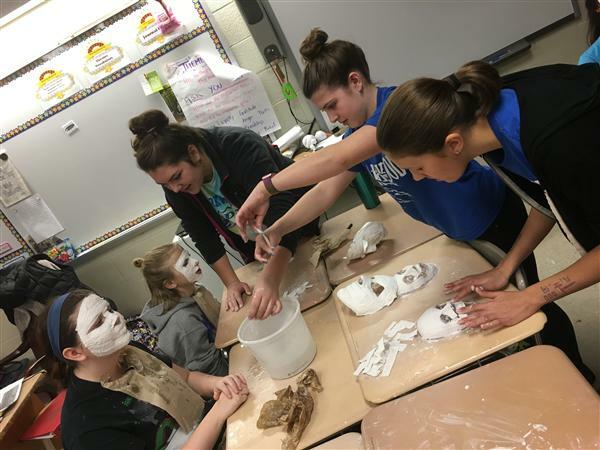 Students in 8th grade are exploring history and creativity in a lesson centered around designing their own masks. Working with plaster strips, molds, and in some cases their own faces, students created blank canvases on which to create their designs. Meet Percy Jackson and the campers at Camp Half-Blood. Students in Mrs. Zaharis’ class ended the novel of The Lightning Thief by making Camp Half-Blood T-shirts and celebrating with “blue” food that Percy ate throughout the novel. Students watched The Lightning Thief movie and had to compare events from the book to the movie. 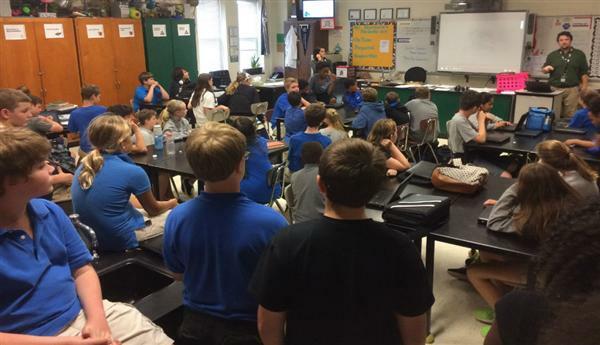 Exciting things are happening with Parkwood Middle School’s Science, Technology, Engineering and Math (STEMs) program. 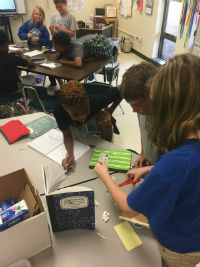 Ms. Leah Villarreal, a first year teacher at Parkwood Middle school, is working hard to teacher her students the power that comes with knowledge of STEMs. Mrs. Powell's class has been studying all about the presidential election this year. Her class has learned about the two major political parties in our country. Her students know who is running for president, what political party they represent, and who their running mates are. Parkwood Middle School is in its second year of implementing the PBIS at our school. This week, students who earned enough tickets in the first six week grading period were rewarded with a snack and a show during the school day. We would like to congratulate our Drama teacher, Ms. Nicole DePietro, on being named PWMS Teacher of the Year. 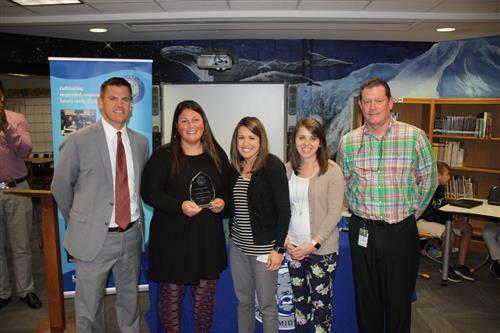 Ms. DePietro was nominated by her fellow teachers and was then observed and interviewed by UCPS employees. Two PWMS Teachers - Mr. Jordan Marmara and Ms. Nicole DePietro - were awarded LIFT Grants from the Union County Education Foundation. Both were in the amount of $500.00 and will be used to enhance learning opportunities at our school. “When will we EVER use this in real life?” is a question constantly asked by students. 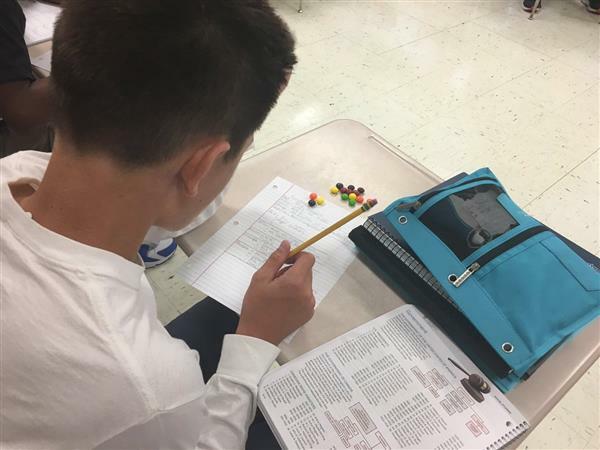 While, Ms. Vaughan’s Math 2 class recently discovered that knowledge of linear regression can help save lives! Parkwood Middle welcomes three new assistant principals for the 2016-2017 school year. Elizabeth Allen, Jacque Pollard and Chad Turner are all three Assistant Principals at Parkwood Middle. These educators come to us with a wide variety of specialties and experiences. Parkwood Middle School Presents: "The Lion King"
Parkwood Middle School Theatre students undertook the incredible challenge of presenting one of Disney's most well known stories, "The Lion King". Featuring students from all three grade levels, "The Lion King" was an enormous success. The 7 th graders of Parkwood Middle School had the opportunity to listen to four veterans share their war experiences and learned how to fold an American Flag on May 16th and 17th in the media center. 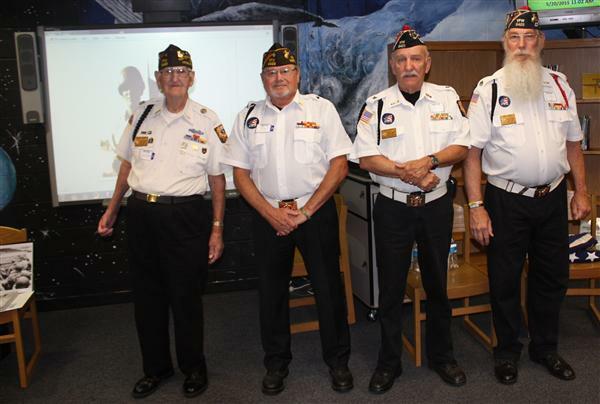 James Crump (WWII), Bill Raum (Vietnam), Jim Hood (Vietnam), and Bill Lane (Vietnam) came from the Indian Trail VFW to talk to the students about what they encountered during war. The Chinese culture is a rich one, with many traditions and unique qualities for students to study. A group of students from Ms. Wang's Chinese class were able to learn even more about the complex society by visiting "Discover China Day", sponsored by UCPS. Last week the PWMS 7th and 8th Grade Bands competed at the Middle School MPA, a contest sponsored by the South Central District Bandmasters Association. After performing several challenging pieces at each of their events, both bands earned a rating of “Excellent” according to the scoring system and were only a few points away from a “Superior” rating. 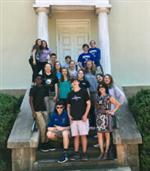 This weekend the Parkwood Middle School Science Olympiad Team participated in the regional competition held in Laurenberg, North Carolina. This was the team’s first year competing, and they were looking forward to getting some experience and learning the ropes. They never expected that they would come home with 12 medals, and overall second place varsity team finish, and an invitation to compete at the state Science Olympiad Competition held in Raleigh next month. Each month the Charles G Monnett III and Associates law firm honors teachers in Mecklenburg, Lincoln, Catawba, Iredell, Cabarrus and Union counties for their service in public education. The nominations for the Hometown Hero Teacher Appreciation Award are ongoing throughout the school year. Winners are chosen based on the number of votes through an online voting contest held on the law firm’s website. 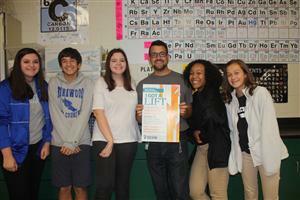 Theatre and Science came together in an unlikely combination in 8th grade science classes at Parkwood Middle School. The result was a highly engaging lesson that allowed students to use inference skills and deductive reasoning to diagnose their classmates. Students and Staff at Parkwood Middle School are getting ready to celebrate the big game this Sunday! Our cafeteria features an incredible mural created by Ms. Howie’s art students of Carolina Panther, Thomas Davis. In addition to showing our Panthers Pride, Parkwood Middle School saw this as a great opportunity to give back to the community. One of the greatest constructions created by man is the famous, "Great Wall of China". In Ms. Howie's art class, students explored the artwork evident within the structure and its connection to Chinese culture. Dr. Martin Luther King, Jr. once said, “Intelligence plus character--that is the goal of true education. The complete education gives one not only power of concentration, but worthy objectives upon which to concentrate.” [ Maroon Tiger (January-February 1947)] At Parkwood Middle School our AIG department has fully embraced that challenge. 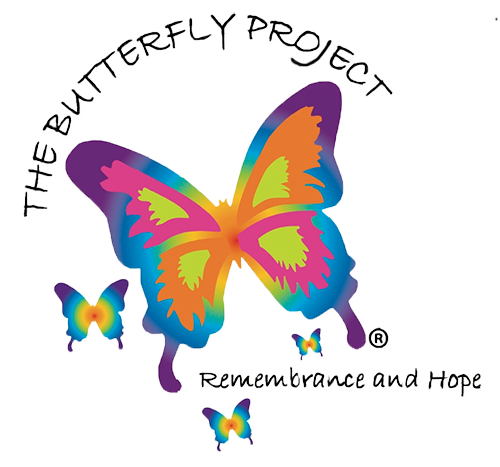 As a part of a unit on Holocaust literature, our students took a trip to the Levine Jewish Community Center in Charlotte to take part in The Butterfly Project. This is a worldwide effort to remember the 1.5 million children who died as a result of the Holocaust. A Dickens of a Celebration! As part of the 8th Grade and 7th Grade AIG Language Arts Curriculum, students at Parkwood Middle School study Charles Dickens's class story, "A Christmas Carol". Every year, the unit culminates in a Victorian Era Celebration, where students are immersed in the world that the characters of "A Christmas Carol" lived in. A Musical for Every Buddy! The movie "Elf", starring Will Ferrell has quickly become a holiday favorite since its release in 2003. Now, 12 years later, the Broadway version of this beloved movie has been adapted for school productions. 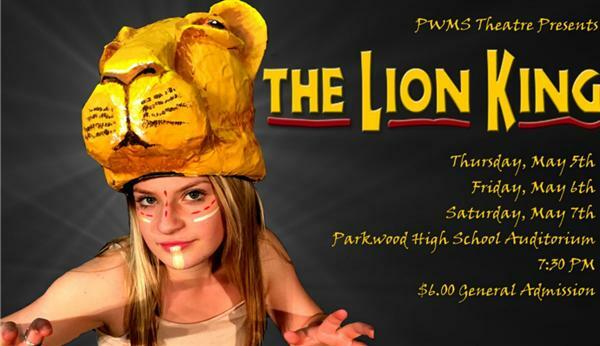 Recently, the PWMS Theatre group brought it to the Parkwood High School's Auditorium. When most of us picture a library, we think of dusty old books lining the shelves, librarians uttering, “shh” every time a sound is made, and oppressive quiet that almost makes it hard to concentrate. Well, most of us would be wrong! Gone are the libraries of old - replaced by buildings that allow us access to more than just books. As part of Mrs. Chapman’s partnership with the Union County Public Library, all students learned from Ms. Beth Myles that the library has DVDs, magazines, audio books, ebooks, research databases, free wifi and so much more. 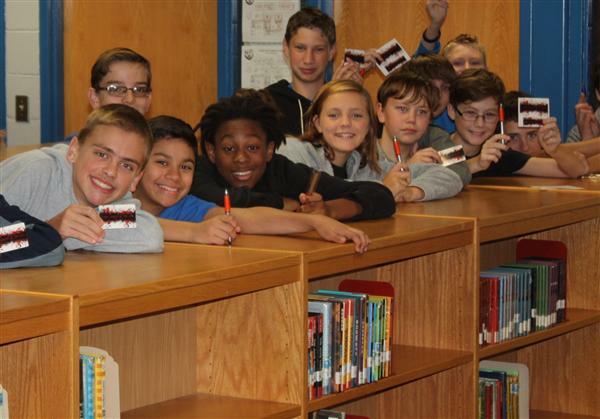 Once students learned of all the resources available to them, many took advantage of the opportunity to get their own library card on Tuesday! They signed up for a temporary card, which expires in three months. Once they visit the library with their parents, they can complete the registration process and receive a card that is valid for one year. Supported by Confucius Institute at Pfeiffer University (CIPU), the calligraphy teacher from CIPU provides the students Chinese calligraphy lessons once a week for a semester in coordination with the Chinese language lessons. The Chinese calligraphy course teaches the fundamental techniques and aesthetic value of 3,500 years Chinese calligraphy and its brief history. 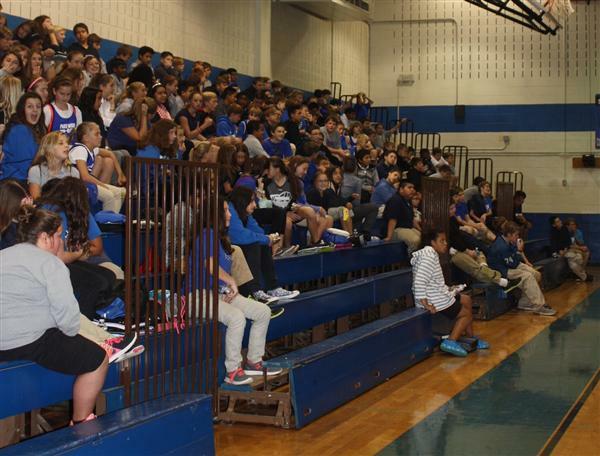 It was an impressive sight in Mr. Marmara’s 8th Grade Science classroom - over 60 6th, 7th and 8th grade students turned out for the Science Olympiad interest meeting. North Carolina Science Olympiad (NCSO) is a non-profit group that hosts competitions all over the state. These competitions are designed to challenge students in areas such as science, technology, engineering, and mathematics. 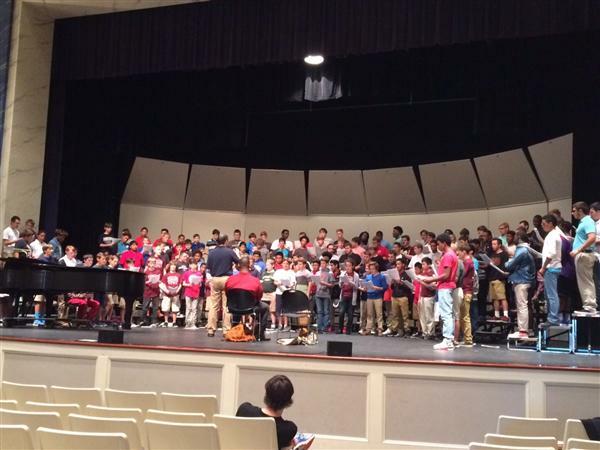 On Wednesday, September 16th, ten students from Parkwood Middle School’s Chorus participated in “Real Men Sing” at Wingate University.